Gmail, Google’s popular free e-mail service, was inaccessible to many of its 36 million users Tuesday afternoon, causing widespread chatter on Twitter and other social networks. The cause of the outage, which Google said lasted an hour and 45 minutes, was not apparent by early Tuesday evening. “We know many of you are having trouble accessing Gmail right now — we are too, and we definitely feel your pain,” Google Engineering Director David Besbris wrote in a 4:15 p.m. ET post on the Gmail blog. “Because this is impacting so many of you, we wanted to let you know we’re currently looking into the issue and hope to have more info to share here shortly,” Besbris wrote. “We’re terribly sorry for the inconvenience and will get Gmail back up and running as soon as possible.” Gmail’s problems were a top trending topic on Twitter, with users trading updates and posting links to blogs such as Mashable, which published a post called, “5 Things to Do While Gmail is Down.” (No. 1: “Immediately flood Twitter with tweets alternately proclaiming “Gmail is down!” and inquiring “Is Gmail down”) “When something like this used to happen, you would wonder if it was just you,” Rachel Sklar, editor-at-large of Mediaite.com, told CNN. “Here, it was immediate that you knew what was going on because of Twitter, and you knew that everyone had the same problems.” At 5:37 p.m. 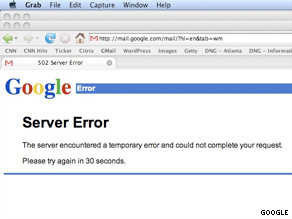 ET, Google updated its Gmail blog to say, “We’ve fixed the issue, and Gmail should be back up and running as usual. We’re still investigating the root cause of this outage, and we’ll share more information soon.” “The heavens opened, and then there was light. Gmail is back up,” wrote one user shortly afterward on Twitter. Gmail had almost 37 million users in June, according to ComScore, a company that measures Internet use. Gmail remains the third-most popular Web-based e-mail service, after Yahoo! Mail and Microsoft’s Hotmail.